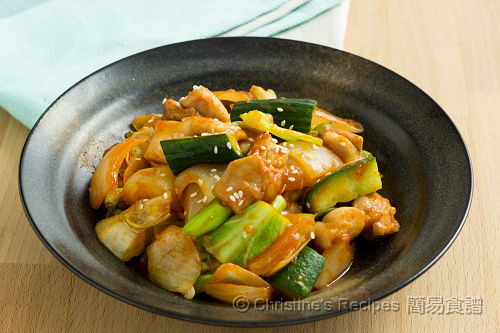 What I love the Korean food is its distinctive hot taste. 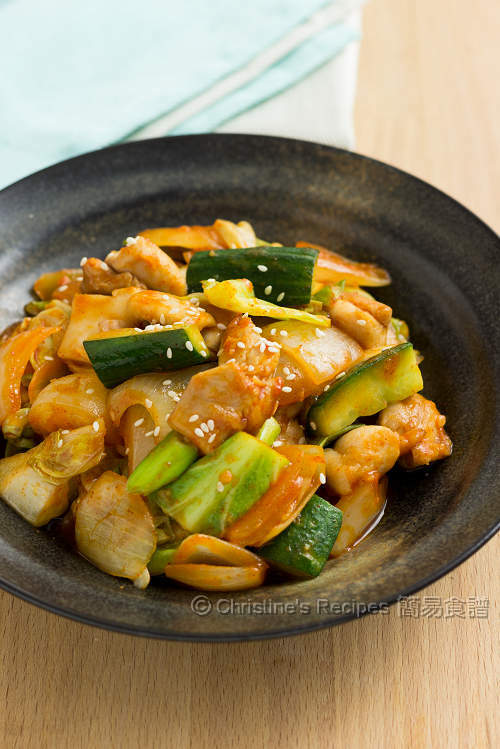 Gochujang (Korean hot pepper paste) is a fermented hot bean paste that is widely used in Korean dishes. Its spicy flavour is blended with a slight sweetness making every dish so unique and addictive. It wouldn’t be the same if without adding the hot pepper paste. The other day I made this chicken stir fry dish with the distinctive paste with some veggies on the go. It really went so well with a bowl of steamed rice. Rinse the chicken. Wipe dry. Cut into bite-sized cubes. Mix with marinade and set aside for about 30 minutes. Heat oil in a wok or frying pan. Saute the onion over medium-high heat until translucent. Push to the sides of wok. Add more oil and sauté garlic. Add chicken and stir fry until its colour changed. Toss in the cabbage and cook until it’s softened. Stir in Korean hot pepper paste, ketchup and sugar. Stir to combine. Add cucumber and cook until softened a bit. Taste then season with salt if needed. Dish up. Sprinkle some sesame seeds for garnish. Serve immediately. 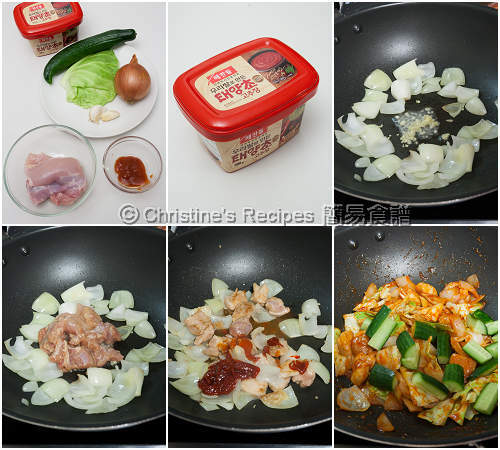 Korean chilli sauce is available at Korean stores or Asian grocers. Adjust the amount of it to your personal preference. A quick and delicious stir-fry, Christine. That looks delicious! I love korean spicy chicken. I need to track down some of that chili paste! Only 135 gym of chicken. Is this right Chistine? Yes, that's what I weighted when making this dish.